This simple eggless mousse puts the milky flavor of white chocolate center stage, highlighted by subtle molasses notes from raw cane sugar. Because this mousse contains little more than the ingredients found in white chocolate itself, it’s important to invest in the best quality you can find; my favorites are Valrhona’s 35 percent Ivoire and Republic del Cacao’s 31 percent Ecuador. 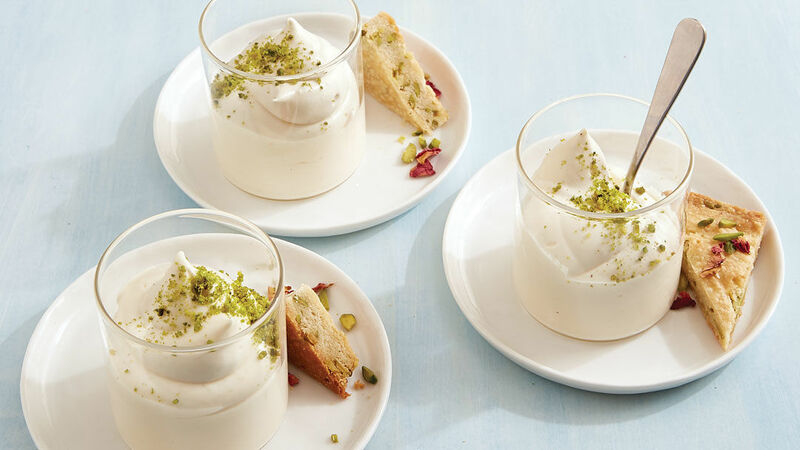 Top with ground pistachios for a pleasing crunch, and serve with Pistachio-Cardamom Shortbread. In a small bowl, mix the gelatin, 2 Tbs. of the milk, and the vanilla with a fork until well combined. Meanwhile, combine the white chocolate, sugar, salt, and 3/4 cup of the milk in a 2-quart stainless-steel saucepan. Warm over medium heat, whisking occasionally, until the white chocolate has melted, about 3 minutes. When the mixture is steaming hot but not simmering, remove from the heat, add the gelatin mixture, and whisk until smooth. In the bowl of a stand mixer fitted with the paddle attachment, beat the chilled white chocolate mixture on medium speed until creamy and smooth, about 90 seconds. Return the mixture to its original container, then pour the cream into the mixer bowl; whip with the whisk attachment until thick and stiff, about 5 minutes. Gently fold in the white chocolate mixture. Pipe or spoon into parfait dishes. Cover and refrigerate for at least 1 hour before serving, or refrigerate for up to 3 days. Before serving, garnish as you like. Made this for a Valentine treat for my family. The roses would've been a nice touch for the holiday, but it was snowing and I didn't feel like trying to track them down. I think it would be a really nice touch though and will try again in the future. This was so easy and fast to put together if you plan ahead. The texture is outstanding. They were scraping the bowls to get every last drop! After a rest, as instructed, it will have more of your typical mousse texture. If stirred ever so slightly, it will knock a little air out and be so light and smooth and creamy dreamy....just lovely.